After nearly 43 years of leading The Cardinal Gibbons School students from one stepping-stone to the next, educator Don DelCiello will be making a leap of his own – into retirement. “Mr. Del,” as he is known affectionately by students, is slated to retire Jan. 30 after serving as counselor, classroom teacher, vice principal, principal, director of guidance and various other roles at the Baltimore school. Mr. DelCiello, whose Italian name and reputation as a stern and demanding, albeit fair, educator earned him the unofficial title of “The Godfather of Gibbons,” said he is retiring to spend more time with family. Prior to his teaching career, the graduate of St. Katharine of Siena School in Baltimore attended St. Charles College, a seminary in Catonsville, then St. Mary’s Seminary in Baltimore. Mr. DelCiello said he had some good teachers in his life and felt it was his calling to be an educator. He began teaching English and Latin at Cardinal Gibbons in 1966, marrying his wife of nearly 42 years, Jean, in February 1967. 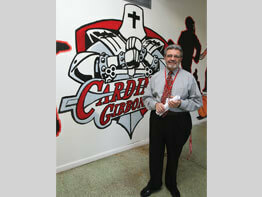 Mr. DelCiello, who is currently serving as director of guidance, said Cardinal Gibbons has been a home away from home for him, with staff and parents often inquiring about his family. “It’s given me an opportunity to grow hopefully as much as I’ve given the students an opportunity to grow,” said Mr. DelCiello. He spoke of the Latin word educo, which means to lead from one place to another. “That’s how I see my work here – taking a group of kids from this place here to the next step,” he said.